Silver Shark belong totally in the fish tank. These fish can grow from the size of your little finger to well over the size of your palm so they definitely are pond fish as well. 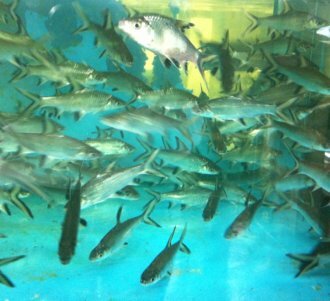 The Silver Shark or sometimes called Bala shark is a fairly common species in the Aquarium Pet Fish trade. Its one of those that you can find, sometimes, in some pet shops, but not all the time in all pet shops. They may have been at one time a food fish but not much these days. The Silver Shark is pretty harmless, definitely not a predator, it is a community fish and sometimes is actually vulnerable to other slightly more aggressive community fish (they may get harassed to death basically). You can generally buy this fish in small sizes from the pet store. They do not generally sell them large even though they do grow to the size of your palm or more. You can find large ones sometimes of course but not often. They are usually sold at about finger size. These guys are your regular pellet feeders. They are however a little bit more subdued than other community fish so its likely better that you have other types of food as well such as red worms. Its quite important to make sure they get their fair share of the food you give else you may find them quite dead. Sadly, I have never really been able to keep these guys for long. I think the other community fish are much better at getting to the food than the Bala Shark and so they lose out. Its likely that in the wild, they live in areas where they do not need to move much to find food as they are really not very energetic. As such, they do not last long in my fish tanks. These fish, when available (as I said, you dont get them all the time) are not very expensive when small (not cheap either). Larger fish, (if you can find them) will likely fetch a higher price but will not be expensive as such. The Silver Shark does not bother other fish at all. They tend to be fairly sluggish and do not dart about like many other fish. As such they are good neighbors for other fish but whether or not they can compete with other fish is a good question. It may be best to keep them by themselves or you need to ensure they get their fair share of the food you give. Commonly known as 'Hangus' or 'Hangus Ekor' in Malaysia, this fish actually originates in Malaysia (may exist in other neighboring countries endemically as well). 'Hangus' means 'burnt, while 'Ekor' means tail. This fish is not at all a shark! Its in fact a freshwater species that lives in lakes and rivers of South-East Asia. Not that there are no freshwater sharks that are really sharks either as I am sure you all know, but this fish is not a shark as in the ones we know very well living in the sea.